Giant shrimp, anchovies and sardines, clams and mussels — known here in Italy as “back gold” — pasta in a shrimp and lemon sauce along with salads and a huge tiramisu cake for dessert. We were cruising the Venice Lagoons aboard the Uniworld River Countess after a morning spent in the fishing area of Chioggia, which, we learned, has a larger wholesale fish market than Venice’s famous Rialto Market. “We try to match the area with the food and get everything as fresh as possible,” Chef Bogdan Antonescu explained. IT’S NOT ABOUT WINNING OR LOSING. 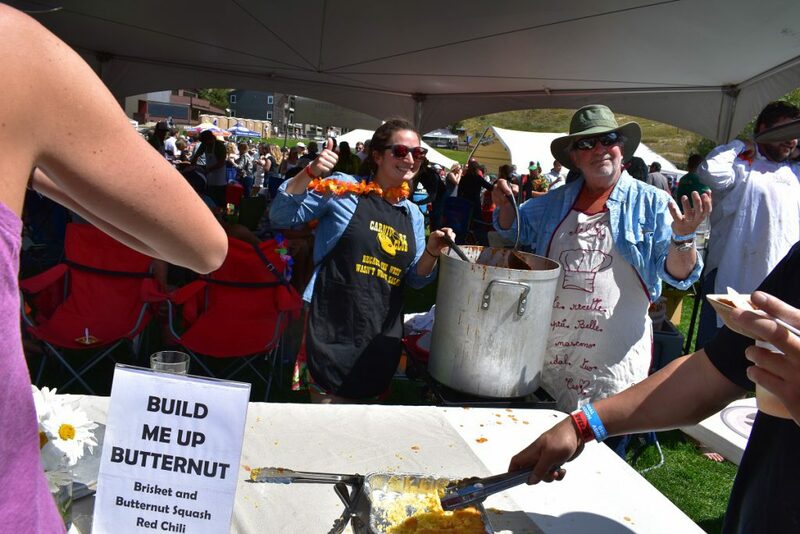 My daughter, Mel, and my husband, Andy, spent two days in our VRBO rental in Crested Butte, Colorado, cooking a 10-gallon pot of Mel’s famous “Build Me Up, Butternut,” chili, their entrée in this year’s Crested Butte Chile and Beer Festival. They were grateful for the first-rate appliances and dishwasher, as well as the help of our old friends from Texas who joined us for the weekend. The two moms made the cornbread — and cleaned up the kitchen each night. A RESTAURANT WORTHY OF THE HIKE. There are no taxis and we’ve missed the last bus. Our only option is a three-quarter-mile hike up a steep hill to Café 3692, a restaurant named for the height (in meters) of the Wetterhorn Mountain, which looms over the town of Grindelwald, along with the Eiger and other peaks in the Jungfrau range. The café’s owners, Myriam and Bruno Kaufmann, have created this 36-seat café on the site of what had been a Kauffmann home, which dated back generations. The restaurant is different from most here as it is only open for dinner Friday and Saturday nights — breakfast and lunch other days. As it is close to the children’s ski school, many families come for breakfast or lunch and there are baskets of kids’ toys and books. There are just a few perfectly prepared dishes — the night we visited osso bucco with polenta and ratatouille; saltimbocca with beef and local ham, apricot and elderberry risotto; sea bass and a pork cutlet served on braised apricots. We toasted our luck at having been told about this place. A LOT BETTER THAN KIBBLE! Pumpkin puree, peanut butter, whole wheat flour, eggs and frosting from smoked carrot puree. “There’s no sugar in it,” the Ambassador Hotel chef promises, as he presents the treat to the just-arrived VIP in Kansas City. In this case, the VIP is our dog, Trooper, and Chef Lyman explains he is “trying out” a new homemade dog biscuit recipe on which I (heart) dogs is spelled out in the orange icing. SNORKELING FOR OUR DINNER. We were in the clear waters teeming with tropical fish about six miles — a 20-minute boat ride — from the private island resort Cayo Espanto in Belize where we were staying, and not far from San Pedro, the town and tourist hub on Ambergris Cay, Belize’s largest island. This immense barrier reef (second only to Australia’s and, according to the Belizeans, much healthier) stretches for scores of miles along the Caribbean Coast (Belize is south of Mexico’s Yucatan Peninsula, east of Guatemala and north of Honduras). Using a hook, our guide caught two spiny lobsters hiding under “tribes” made from corrugated tin and logs by fisherman. My husband and the guides caught a baker’s dozen of small snapper while we got an onboard lesson in making ceviche from the conch. When we got back to the dock, the resort chef was waiting with suggestions on how he would prepare our seafood feast — grilled lobster, snapper blackened and grilled, served in candlelight on our private dock. At the new Toy Story Land at Walt Disney World’s Hollywood Studios, check the “Totchos” at Woody’s Lunch Box — potato barrels coated with chili, cheese, queso and corn chips. I couldn’t stop thinking about the BBQ Brisket Melt and the grilled three-cheese sandwich.